Originally published in the Official Alumni Publication of the Ostrow School of Dentistry of USC, TroDent, Fall 2014 edition. 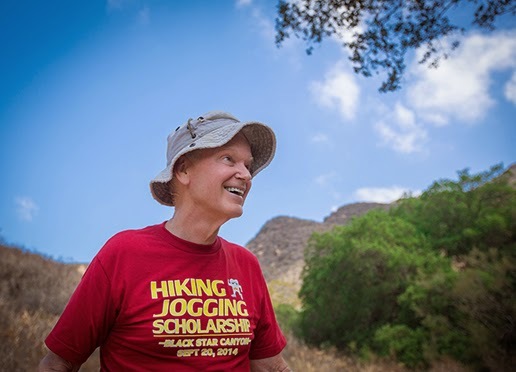 In 2011, Dr. David Eggleston began a Hiking/Jogging Scholarship at the Herman Ostrow School of Dentistry. The scholarship has grown in popularity during the past three years. This year’s hike paid almost $30,000 (divided into shares)to students who participated. Those who beat Eggleston hiking to the mountaintop, and those jogging under an hour to the mountaintop, were rewarded two shares. Joggers who finished ahead of Dr. Parish Sedghizadeh received three shares. We asked Eggleston what inspired him to start the event and how it inspires him personally. A few years ago, UCI student Andrew Vo DDS ’15 was shadowing me at my office while contemplating a career in dentistry. Among his assortment of part-time jobs, he was a spin instructor and physical trainer for 24 Hour Fitness. How perfect was that? I could get some free exercise training while giving advice on dentistry—so we went hiking. Andrew can annihilate me pole-vaulting (I’ve never pole-vaulted), cycling and in the gym, but I can hold my own hiking with him. After a year or so of hiking together, he started dental school and invited some dental students to join us. In 2011, I challenged the students to a hike up Black Star Canyon, just east of Irvine Lake in Orange County. In a moment of improvised bravado, I told them I would make a scholarship donation to anyone who could get to the top ahead of me. We set a date for the challenge and thus started the Hiking/Jogging Scholarship annual event. Three years have passed, along with a steep learning curve. By all accounts, our fourth annual event was a huge success. More than 200 participated, including faculty, friends, dental student families and a few pet dogs. Be sure to check it out at www.schikeandjog.com. We are very grateful to Patterson Dental, along with numerous individuals, who have stepped up as sponsors. Hiking is an excellent cardiovascular exercise and a great way to slow down the degenerative diseases of aging. Hiking avoids the knee damage of running, the run-over danger in road cycling, the broken bones of mountain biking and skiing and the tennis elbow of tennis. Maintaining a rigorous hiking regimen requires an achievable goal for inspiration. It’s hard to get up at 5:30 on a Saturday morning for a 10-mile speed hike if there is no incentive. My goal is to maintain the ability to hike with 20-something-year-old dental students. It is just a personal goal, certainly nothing like a goal of ending world hunger or preventing birth defects. However, it leads to an improvement in personal health and well-being, which can help in achieving more altruistic goals. Since dentistry is a sedentary profession, I hope the Hiking/Jogging Scholarship event inspires dental students to consider a lifetime of vigorous exercise and all the ensuing benefits. The current dental students have the potential to be a great generation of dentists, maybe even the greatest generation. They are motivated and dedicated. Beyond that, they have a camaraderie that supersedes competition. They genuinely want to help each other as well as their patients, which bodes well for the future of the dental profession. The students are my inspiration to help in any way possible.